A map projection is any method of representing the surface of a sphere or other three-dimensional body on a plane. Map projections are necessary for creating maps. Because it is impossible to accurately represent the spherical surface of the earth on a flat piece of paper. If imagine peeling an orange and pressing the orange peel flat on a table - the peel would crack and break as it was flattened because it can't easily transform from a sphere to a plane. The same is true for the surface of the earth and that's why we use map projections. The term map projection can be thought of literally as a projection. If we were to place a light bulb inside a translucent globe and project the image onto a wall - we'd have a map projection. However, instead of projecting a light, cartographers use mathematical formulas to create projections. 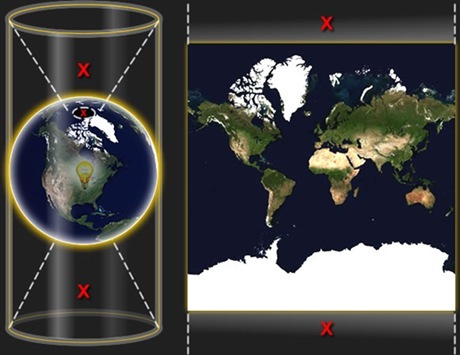 Depending on the purpose of a map, the cartographer will attempt to eliminate distortion in one or several aspects of the map. Remember that not all aspects can be accurate so the map maker must choose which distortions are less important than the others. The map maker may also choose to allow a little distortion in all four of these aspects to produce the right type of map. A very famous projection is the Mercator Map. Geradus Mercator invented his famous projection in 1569 as an aid to navigators. On his map, lines of latitude and longitude intersect at right angles and thus the direction of travel - the rhumb line - is consistent. The distortion of the Mercator Map increases as you move north and south from the equator. On Mercator's map Antarctica appears to be a huge continent that wraps around the earth and Greenland appears to be just as large as South America although Greenland is merely one-eighth the size of South America. Mercator never intended his map to be used for purposes other than navigation although it became one of the most popular world map projections. Google Maps is based on a close variant of the Mercator projection. Because the Mercator projects the poles at infinity, Google Maps cannot show the poles. Instead it cuts off coverage at 85° north and south. This is not considered a limitation, given the purpose of the service.